The art has survived for centuries through generations as its trade secrets like composition of colours were zealously guarded by a handful of artist and their families. Artists like Ustad Allah Waaya, Ustad Allah Diaya, Aziz Ahmand and Mian Rahim Bux were great Kahigar in their times and have left lasting work in the field. Their work ahs lent an immortality to the art. 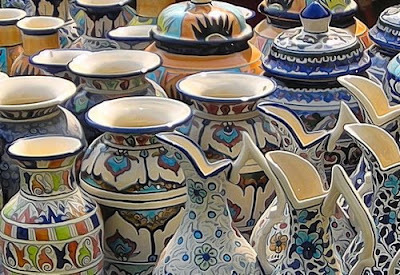 In 1985, Punjab small industries corporation established an Institute of Blue Pottery Development to save the art from extinction. It further aimed at providing training advisory technical and processing facilities to the private sector in carrying out research and development in the hereditary art of Multan. The institute has trained many artist and developed over 400 designs of pottery and decoration ware. The Institute produces pieces that are sold in the market. Some new ceramic units have been set p in Multan through advisory service and technical assistance of the institute. In 1853,during a limited excavation on Qillah Kohna Qasim Bagh, Alexander Cunningham found glazed tiles made in Multan in about 900 A. These tiles had been used in the mosque built by Muhammad Bin Qasim on his arrival in Multan. The highest quality Multani tiles have been used in shrines, mosques and other important buildings including house ever since. The shrines of Shah Yousaf Gardezi (1153), Shah Rukne Alam, Ali Akbar, mosque Nawaban, Shrines of Uchh Sharif in Cholistan and Talpuir tombs in Sindh are classic examples of tile work. Kashi work on the walls of shrine of Hazrat Haqani, Sawi Mosque, Shrines of Abdul Latif, and Sachal Sarmast (Sindh) Eidgah Multan and Lahore museum is very distinctive and of a fine quality. Lately Akhtar Abbas Bharwana (ex minister Punjab) has used the tiles from Multan at his house in Jhang. A contemporary artist Ustad Muhammad Alam has executed Kashi work in the house of late actor Sultan Rahi in Lahore. Blue pottery of Multan is at display in prestigious presidents house, prime ministers secretariat, culture missions of Pakistan in different countries and British Museum London.” Foreign tourists and private collectors love to buy vases vessels planters, cookie jars and table lamps with hand painted in designs like China Kashi, Special Kashi and Bamboo Shoot. World Bank team has also visited the Institute and shown keen interest in the conservation and development of the art. Paradoxically, local patrons are not very attracted to these products. “Tea set costing rupees 1200/ does not find very many buyers in the local market,” says Hassan Khan, a shopkeeper who sells the ware. The process of making blue pottery and tiles has undergone many changes with the development in technology. Gas furnaces with controllable and uniform temperature are being used for biscuit firings and glazing instead of wood and dung cake fire. Clay is being procured from Manshera (NWFP), Tharparker (Sindh) and Gujrat instead of local red clay. ” Baking of raw material as per the formula, grinding, kneading, filtration, moulding, biscuit firing at the temperature of 800-850 degree centigrade, Kashi work and glazing at the temperature of 1200 centigrade are all necessary steps in the process,” explained one young artist Muhammad Irfan wile showing everything being done at his concern by 20 ceramists and 15 Kashi artist and their students. “The special blue colour prepared from cobalt oxide and copper oxide is a special technique and distinctive feature of the Kashi work,” he says. The art has evolved into a far more sophisticated process today. Artist Muhammad Alam who along with his sons is associated with the Kashi work on has represented Pakistan in world crafts council under SAARC program. He has trained over 40 students out of which some are working abroad. “I am working on new designs development and expansion of the noble art. But my work has not been recognized yet.” Muhammad Alam complains a little wistfully. “Besides I don’t have enough money, ” he adds. Among the various arts that are practiced in Pakistan, Multani Kashi work has attained a higher state of refinement. There is always a room to bring into the art new innovations, endow it with fresh spirit and set the science as its guide. Assistance can be sought from international agencies like UNESCO and the World Bank. The range of possibilities in the field of ceramics is very vast. The whole world can be our market.